Alden Cottam was born in the small town of Jasper in the Canadian Rocky Mountains, on 29 August 1912. 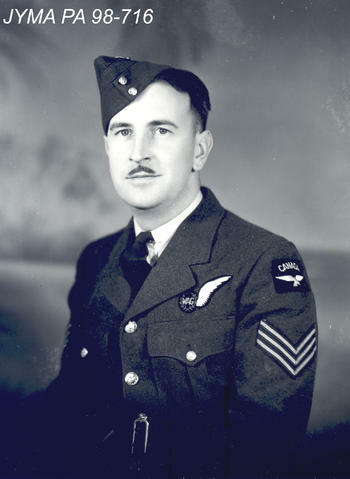 He joined the RCAF in February 1941 and qualified as a wireless operator/air gunner. After arriving in England he was posted to a training unit, 1654 Conversion Unit. In October 1942, he was sent from there to 50 Squadron at RAF Swinderby. He flew on a number of operations with Sgt A L Kitching as pilot, and then joined Henry Maudslay’s crew for an operation to Essen on 21 January 1943. He was posted to 617 Squadron in 25 March as part of Maudslay’s crew. He died along with the rest of this crew when they were shot down near Emmerich, limping back in an aircraft damaged during the attack on the Eder Dam. Alden Cottam is now buried alongside his comrades in Reichswald Cemetery.